Snakeflies are related to lacewings. The adult has a long thorax and is able to raise the head above the rest of the body which gives it the appearance of a snake ready to strike. Snakeflies are found only in western North America. Larvae live under the bark of forest, ornamental and fruit trees and can be very helpful predators in fruit orchards. Adults also are predaceous. Larvae feed on wood-boring insects, small insects such as aphids and caterpillars, and various insect eggs. 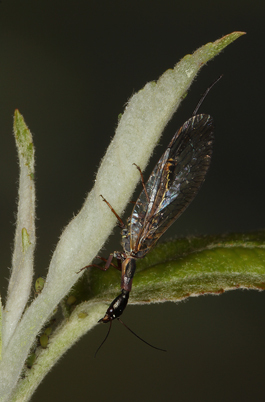 Snakefly adults feed on aphids or other small, weak prey. In pear orchards, they are important predators of pear psylla, especially in the early season. The egg is elongated and cylindrical with a small appendage at one end. The larva is long and flattened with a black shiny head and prothorax and three pairs of legs. It can be from 1/2 to almost 1 inch (12 to 25 mm) long and is a mottled reddish or grayish color. The pupa is active and not enclosed in a cocoon. Snakeflies have four membranous wings which are held roof-like over the body when at rest. The wings, which have many veins, are from 1/4 to 2/3 inch (6 to 17 mm) long. The prothorax is elongated. The female is usually slightly larger than the male and has a long tail-like ovipositor. Most species have one generation each year but take 2 to 3 years to complete their life cycle. The larva overwinters in a small depression on the bark surface covered by small pieces of bark. After pupation under the bark, adults emerge and disperse in search of prey. They can be seen in orchards throughout the season. Eggs are laid in clusters in bark crevices. Larvae are usually found under the bark in galleries of various wood-boring insects. They also feed on small insects such as aphids, caterpillars and insect eggs deposited on the bark. A beating tray is only moderately effective for monitoring snakeflies since adults are fairly active and often will not drop when a limb is tapped. However, because of their large size and unusual appearance, adult snakeflies are easy to see on the foliage. Snakeflies are most likely to be found in orchards where woodland or wild habitat is close by. Because larvae feed on wood-boring insects, maintaining unsprayed vegetation that is infested with such insects close to the orchard will provide snakeflies with an additional food source. However, there is the risk that the wood-boring insects will also invade the orchard.